Cinque Terre Small Group Tour: 8 days with Amber Road » Our 17th year! The tour begins with a coach transfer from Florence. 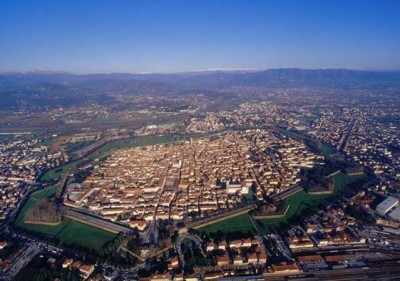 Our first destination is the walled city of Lucca, one of the most pleasing towns in all of Tuscany. A morning walk will take us through olive covered hills and tiny villages above the city. In the evening we’ll attend a Puccini concert at the Basilica of San Giovanni, one of Italy’s most beautiful churches. 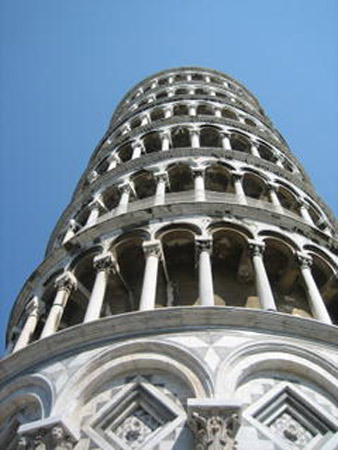 We’ll climb up the Leaning Tower at Pisa. 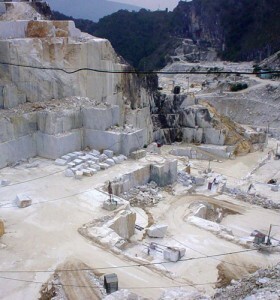 Before leaving Tuscany we’ll visit the marble quarries and artist studio at Carrara. 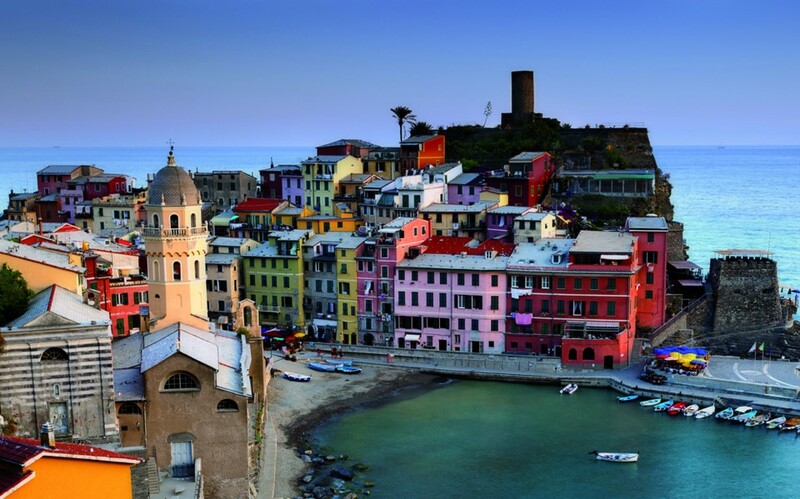 The walk through the five villages of the Cinque Terre highlight our time in Liguria. Your hotel rooms in Monterosso al Mare feature spectacular views of the Tyrrhenian Sea. Finally we’ll visit the fabulous riviera resort of Santa Margherita Ligure and the intriguing sea port of Genova. Michelangelo’s David at the Accademia Museum and a pre tour exploration of Florence is also included! Arrival at Florence airport, where you will be met by your tour manager and transferred to Lucca, the most beautiful city in northern Tuscany and home of composer Giacomo Puccini. You’ll be staying at the Hotel Ilaria for 3 nights, located in the center of the historic district. Late afternoon free for your own explorations and shopping. Hotel bicycles are available for riding the 4 kilometer ramparts that encircle Lucca. At 7pm welcome meeting & aperitifs, followed by dinner at one of Lucca’s best restaurants. Lucca is rich in history – Roman origins, medieval and renaissance power and wealth. Our local guide will walk us through these eras, from Imperial times to the Lucca of the 1800’s, a century that began with the reign of Elisa Bonaparte. We’ll explore the massive walls and fortifications, the piazzas and palazzos of Lucca’s many transformations. 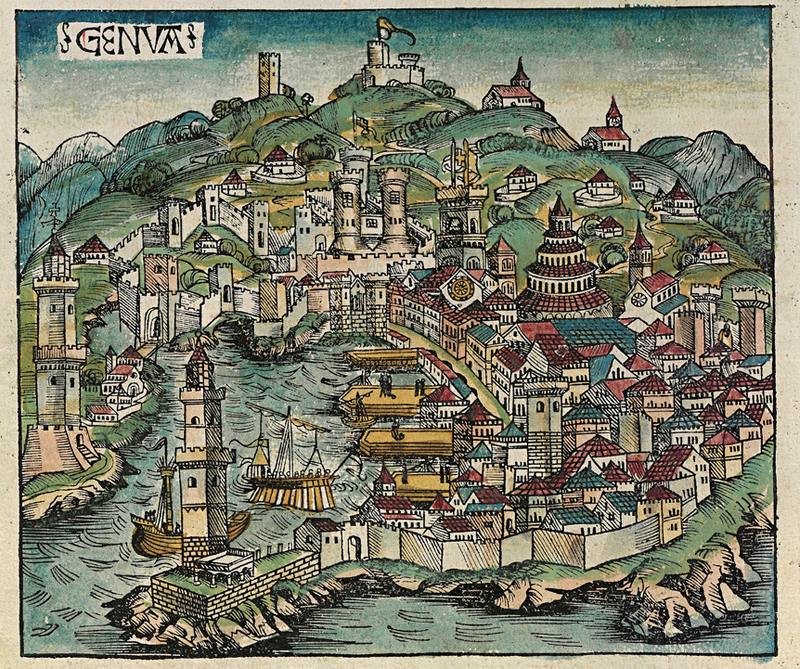 Pisa was one of the four medieval powerhouse maritime republics, along with Genoa, Amalfi and Venice. They established trading posts and colonies throughout the Mediterranean. Pisans, being ruthless pirates, were widely feared and hated – giving rise to the expression, “better a death in the family than a Pisan at the door”. After a raid on Saracen Palermo they returned home with enough booty to initiate the Square of Miracles, the most amazing architectural complex in the world. This afternoon we’ll have a fantastic guided tour of the Pisa historic center, the Duomo and Baptistery and finish with a climb up the famous Leaning Tower. The Via Francigena was the medieval pilgrim and tourist route from northern Europe to Rome. This morning we’ll walk 7 kilometers of it in the lovely hills above Lucca, through olive groves, vineyards and small hamlets. Mid-route we’ll stop to visit an olive oil mill at a 17th century farmhouse. A refreshing lunch with local wines at a village café will follow. This evening we’ll take in a Puccini concert at the Church of San Giovanni. 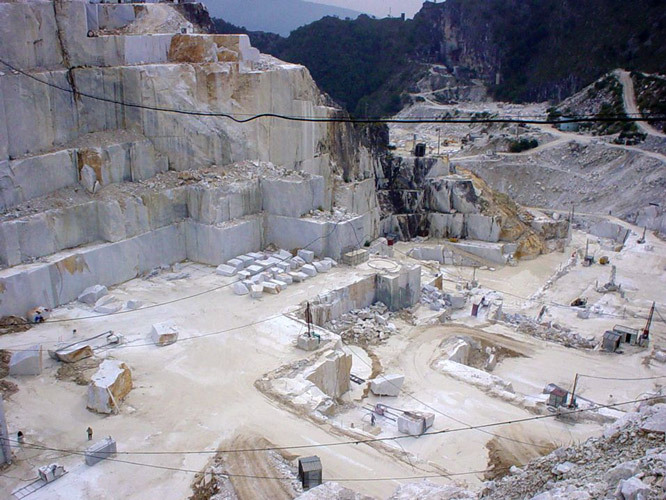 Carrara has been one of the world’s most famous mining centers since the time of Julius Caesar and still produces 800,000 tons a year of the same white marble that was the source of many of Michelangelo’s most famous creations. This morning we’ll have a fascinating guided tour of the quarries. The village of Colonnata, known for its unique production of lard, lies in the mountains high above Carrara and is where we’ll sample the local fare. 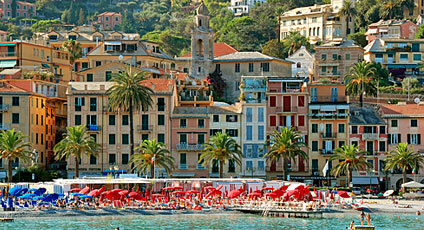 Then, the spectacular Cinque Terre – we’ll be staying in Monterosso al Mare, the northernmost of the five villages. The Cinque Terre coastline was inhabited in ancient times by the Ligurian tribes, then settled by Greeks, conquered by the Romans, then dominated by Byzantines, Longobards and finally the city-state of Genoa. This land of rural fishermen and farmers, once accessible only by sea and by mule paths, now comprises the Cinque Terre National Park where we’ll spend our next two nights. The Porto Roca is a beautiful hotel perched on a cliff with spectacular views overlooking the Ligurian Sea. This morning we’ll ride the train back to the first village, Riomaggiore, and do an easy two hour walk along a cliff-side footpath. 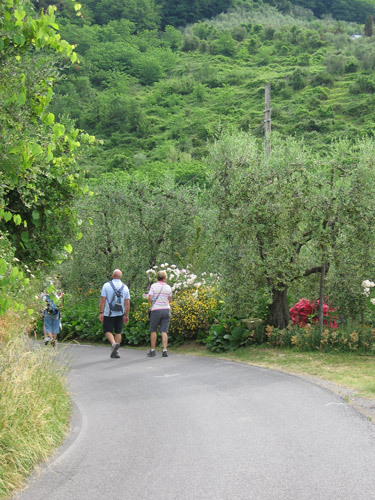 We’ll pass through Manarola and terminate our walk in Corniglia where you’ll certainly want to stop for lunch. After which you can return by local train or boat to Monterosso or continue your hike on to Vernazza (90 minutes). Your tour manager will be on hand to assist. The rest of the afternoon is yours to enjoy one of the most pleasing areas in all of Italy. Included dinner on the hotel terrace with dazzling sea views! Our exploration of the Ligurian coastline will continue with a morning in Santa Margherita Ligure, a lovely seaside resort with garden villas and grand hotels. Transfer to Genoa. We’ll be staying two nights at the Hotel Bristol Palace. Genoa is an often overlooked destination because of its somewhat-hard-to-access location squeezed on a narrow stretch of land between the Apennine mountains and the Ligurian Sea. 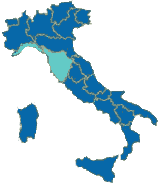 For many centuries this was one of the grand powers of Italy – an empire of seafarers, traders, bankers and shipbuilders. Its historical legacy was to leave behind a beautiful and intriguing city like none other on this marvelous peninsula as our local guide will illuminate this afternoon. Evening free to wander the maze of pedestrian lanes of the largest medieval city center of Europe. One of the most interesting and entertaining museums anywhere awaits our morning visit in Genoa – the Galata Museo del Mare (Museum of the Sea) – a multi-media masterpiece where you can board sailing vessels in one century and emigrate to the Americas in another. Afternoon free for your own explorations. The best of Genovese cuisine will be presented for our farewell dinner in the exquisite setting of an early 17th century palace. Morning transfers to Genoa airport and Genoa Brignole train station. Day 1 transfer from Florence Peretola Airport is at 14:00 and, upon request, from Pisa airport to Lucca. Pre tour: We recommend arriving to Florence a day or more early. The city center/historic district is just a 10-15 minute taxi ride from the airport. 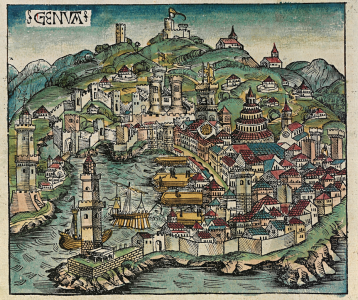 Post tour: Genoa is a fascinating port city, well worth an extra day. Upon request we can book you an additional night at Hotel Bristol Palace and add the room cost to your balance payment. Suggestions: Our May 24-31, 2019 Lucca, Genova & Cinque Terre tour fits back to back with either the May 10-22 Italian Lakes & Milan and the June 1-7 Tuscan Hill Towns tours. The September 5-12, 2019 tour fits back to back with the September 13-25 Italian Lakes tour. Be prepared to spend a few hours a day on your feet and an uphill walk to the hotel in Monterosso. The 3.2 mile Northern Hills Medieval Walk the morning of Day 3 is along an up and down, panoramic one lane paved road. The Cinque Terre Day 5 walk from Riomaggiore to Corniglia is along a cliff-side footpath overlooking the Ligurian sea. The path is sometimes smooth, sometimes rough with some inclines. Duration is one and a half hours. This tour is not suited for anyone who has problems with knees, back, heart, obesity or those who cannot manage steps and moderate inclines. Age is not important as long as you are reasonably fit and a good walker. If you have mobility issues this is not the right tour for you. Please call us if you have questions. Transfers from Florence Airport on Day 1 (available only at scheduled time). Transfer from Pisa airport to Lucca hotel available upon request. All ground transportation Days 2 to 7, including tour manager and drivers. Transfers on Day 8 to Genoa airport or train station, 7 nights hotel accommodations with breakfast, 3 dinners and 2 lunches including beverages (wine or beer or soft drinks and water). Admissions to all sites visited as a group, as listed in bold in the tour itinerary. The transfer from Florence Peretola airport to our first hotel destination will be at 2pm. For all other arrival times: the hotel is located inside the historic district of Lucca. 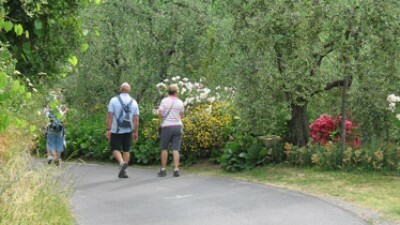 It is about 45 minutes by taxi from the Florence airport or one hour by train or taxi from the Florence train station. Upon request we will send you detailed arrival instructions. Be prepared to spend a few hours a day on your feet and an uphill walk to the hotel in Monterosso. The 3.2 mile Northern Hills Medieval Walk the morning of Day 3 is along an up and down, panoramic one lane paved road. The Cinque Terre Day 5 walk from Riomaggiore to Corniglia is along a cliff-side footpath overlooking the Ligurian sea. The path is sometimes smooth, sometimes rough with some inclines. Duration is one and a half hours. This tour is not suited for anyone who has problems with knees, back, heart, obesity or those who cannot manage steps and moderate inclines. Age is not important as long as you are reasonably fit and a good walker. If you have any difficulty walking this is not the right tour for you. Are located in quiet locations within historic districts or a short distance outside the city walls. European hotel rooms are generally smaller than those in the U.S., and have one queen bed or two single beds, with private bath. The rooms and balconies at Hotel Porto Roca are of varying sizes with varying views. Upgrades to junior suites are available. We have space available for one or two singles on each of our tours. They are provided with single-use double rooms. The additional single supplement cost is 600 euros. Please contact us for availability prior to booking.